2016 Valley Forge Young Patriots Fun Run! Are you looking for some exciting family fun? Why not grab your entire family and register for the 2016 Valley Forge Young Patriots Fun Run! I have done some amazing runs over the last few years and this is definitely one that I'd love to do with my family! 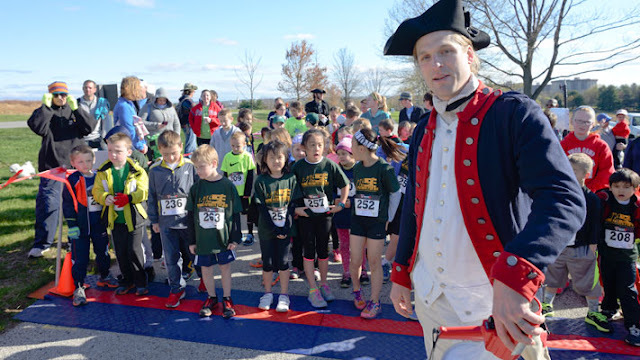 There are only a few days left for early registration for the Valley Forge Revolutionary 5-Mile Run, 3-Mile Walk and Young Patriots Fun Run! The event takes place in the beautiful Valley Forge National Historical Park on Sunday, April 17, and is a fun and unique way to get kids involved and excited about American history. The Young Patriot Fun Run is approximately one mile and is for kids ages 6-13. Registration is $10/child before March 17 and $15/child after March 18. Pre-registration is required as there is no on-site registration. The race, presented by the Valley Forge Tourism & Convention Board, provides funding for initiatives that both improve and preserve the park. This year, the Rev Run will celebrate the 100th anniversary of the National Park Service and Valley Forge National Historical Park’s 40th year as a national park. Runners from all over are encouraged to conquer the five-mile, USA Track & Field-certified course, while others can participate in the 3-Mile Walk or Young Patriots Fun Run. The race has raised a total of $242,000 over the past ten years to support Park and Visitor Center improvements. “Valley Forge National Historical Park is one of the region’s most visited destinations and we are eager to help preserve and improve the Park with funds from this year’s Rev Run,” said Mike Bowman, president and CEO, Valley Forge Tourism & Convention Board. “We’re excited to celebrate the National Park Service’s 100th anniversary, as well as 40 years of Valley Forge as a national park, with a race that helps to preserve one of the nation's historic gems,” added Kate Hammond, superintendent, Valley Forge National Historical Park. The five-miler starts at 8:30 a.m., passing significant monuments, cannons, log cabins, and the National Memorial Arch, which commemorates the service and sacrifice of the men and women of the Valley Forge encampment. The three-mile walk begins at 8:40 a.m., following much of the same course. Dogs on leashes are permitted for this walk. Kids ages 6–14 are encouraged to join in the Young Patriots 1.776 km Fun Run (approximately one mile) at 8:50 a.m. Each of the young runners receives a participant’s medal.